“We are experiencing some issues currently with the website. Please check back at a later time.” This was the message that greeted visitors to Wayne County’s website on August 8, 2018. 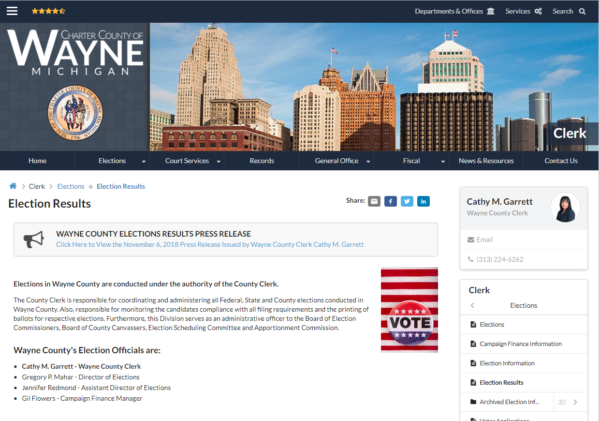 At that time, Wayne County residents sought election results from the Wayne County Clerk’s office, which is a section on the Wayne County website. On August 9, 2018, the election results were still unavailable to the community. The reason was the election software the County Clerk’s office used on its website to tabulate results: ElectionSource. 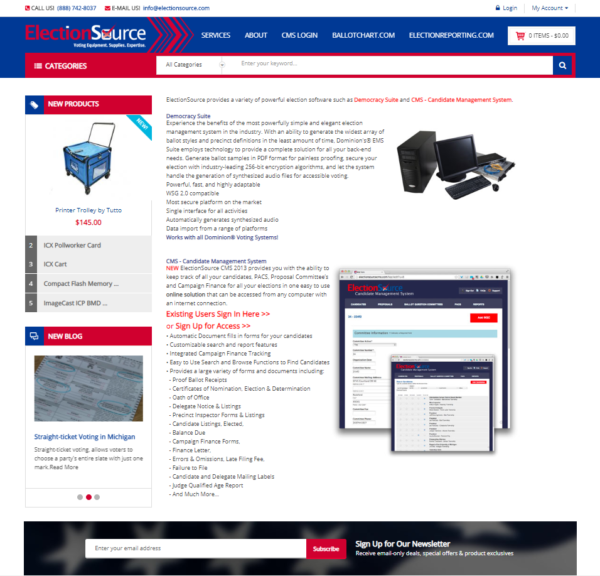 ElectionSource Website promotes its software. Wayne County probably doesn’t agree. The next election took place November 6, 2018, but ElectionSource software had already been removed from the website. The County Clerk’s office offered PDFs of voter results instead of real-time results. The Current Value is listed at $20,600,000.00. Effective March 28, 2018, this Contract is increased by $2,700,000.00 for Department of State use. Please note the Program Manager has been changed to David Tarrant. All other terms, conditions, specifications and pricing remain the same. 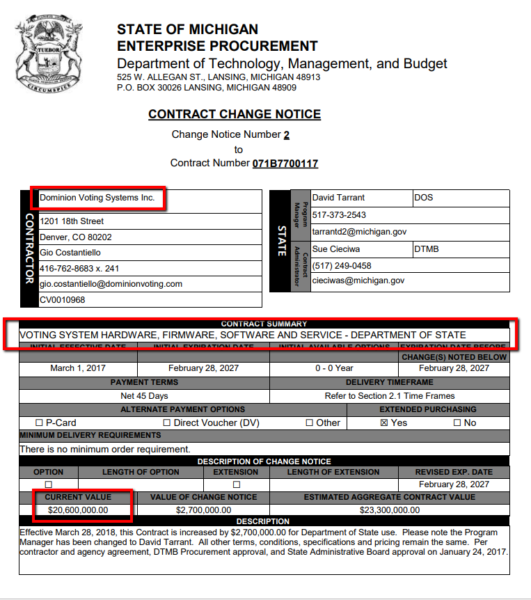 Per contractor and agency agreement, DTMB Procurement approval, and State Administrative Board approval on January 24, 2017. The Lead Project Team Manager is a key part of ElectionSource’s organizational structure. The Lead Project Team Manager will work with Dominion to coordinate the shipping of equipment and software for each jurisdiction. The Lead Project Manager will then turn over coordination of setup and training of voting equipment to the County assigned Project Managers who will then oversee this process. Our County Project Managers will work with each county to develop and implement a plan that best suits the needs of all the municipalities within the county. ElectionSource will then provide progress reports to each of the counties on a regular basis. Our County Project Managers will work with all our team leaders and support technicians to provide the necessary training and support needed by each county. Their goal is to provide a level of training that will allow the municipalities to be self-sufficient needing only minimal support from our technicians. A change order is submitted. 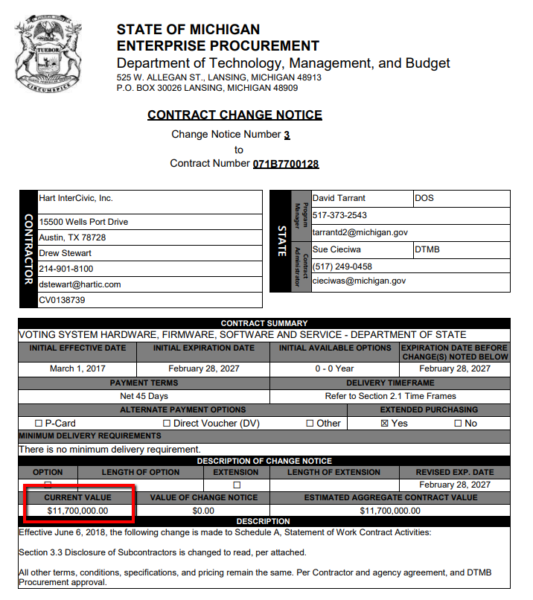 Hart InterCivic, Inc. is contracted by State of Michigan Department of Technology, Management, and Budget. The Current Value of the contract is listed at $11,700,000.00. The Detroit News reports that “Wayne County spokeswoman Lisa Williams-Jackson” e-mailed The Detroit News early Wednesday morning, and claimed that “the issue was with the vendor’s server and web display, ‘which was causing reporting fluctuations. '” Although the results were fluctuating online, the ballot tabulations remained correct, according to Williams-Jackson’s e-mail. The county resolves the issue by uploading “Unofficial Summary Reports” on its website in the form of PDF files. Wayne County Board of Canvassers meets to discuss the election failure. There were “several issues that really just make it more of a reason why people don’t vote,” Sheffield said. In the article, Matt Bernhard, a grad student at the University of Michigan and voting machine security expert, discusses the ease with which he can manipulate voting machines. He even has multiple videos where he shows how he opens different kinds of “plastic tamper-evident ties used in Michigan” in a matter of seconds. 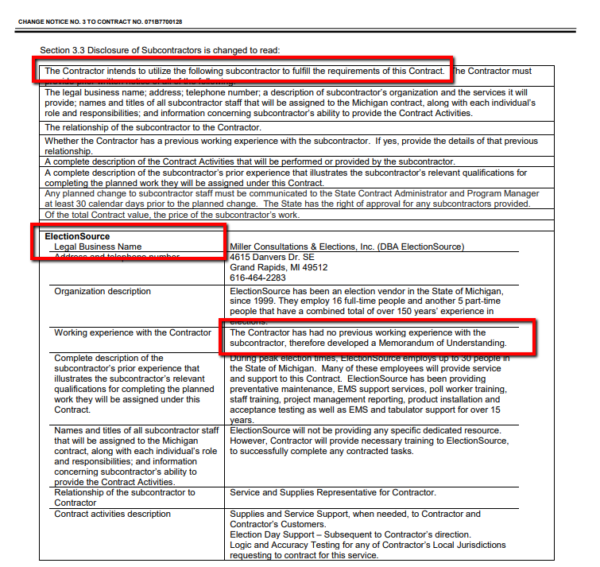 This connects to ElectionSource in the following way: Bernhard found the types of seals and certificates used to secure Michigan’s election equipment and ballots on the Secretary of State’s website. He then ordered two types of election seals, several paper seals, tamper-evident stickers, and election certificates from ElectionSource’s website. Bernhard said ElectionSource failed to inquire as to whom the seals were delivered. They did not ask why the items were needed nor did they ensure the transaction was to an authorized election official. 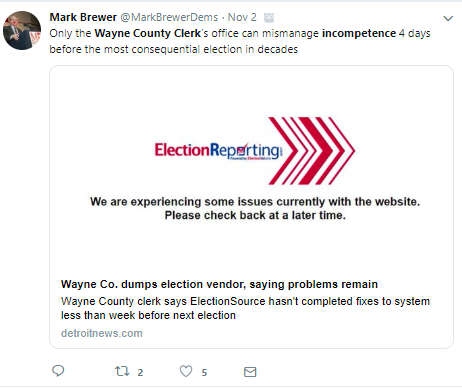 The Detroit News reports that Wayne County officials “are dumping” ElectionSource – only days before the November election. What’s Next for Wayne County Voters? It remains to be seen what Wayne County does regarding voting machines, software, election day support, and maintenance moving forward. Next Next post: What’s the Best Website Design for an IT Company? How Do I Market It?